Most musicians would be ready to call it a full career after decades backing such country, folk and pop luminaries as Waylon Jennings, Roy Orbison, Dottie West, Johnny Paycheck, Jimmy Webb and Nanci Griffith on the stage and in the studio. 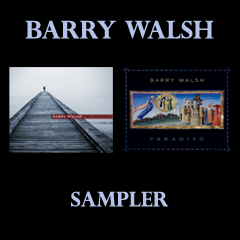 But virtuosic Nashville-based pianist Barry Walsh isn’t like most musicians. Sure, he’s done all that and more, but he’s also fashioned a new career for himself as musical partner to revered singer-songwriter Gretchen Peters and an artist in his own right. Paradiso—his second solo album—is the sound of a player who spent years shaping his keyboard contributions to the contours of other people’s music finally staking his courageous claim to creative freedom.